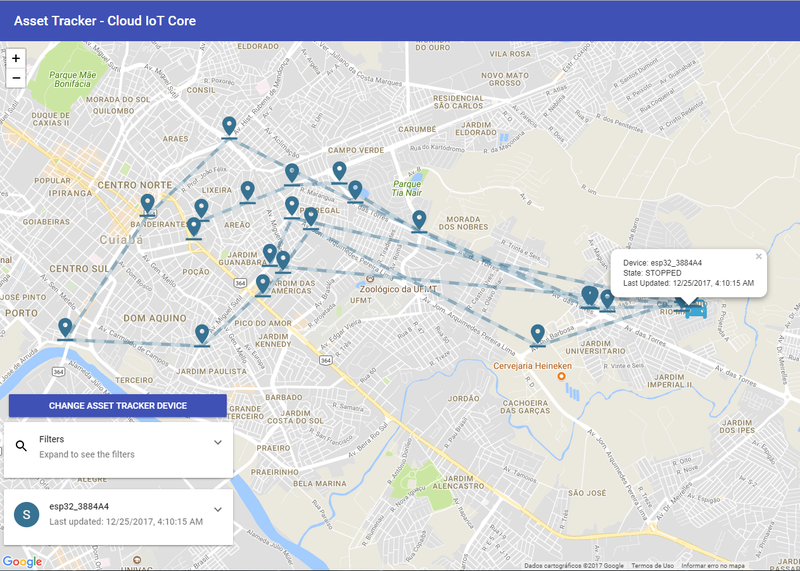 Track your goods anywhere and anytime with a GPS tracker sending location data over mobile network to an awesome cloud and serverless architecture. Our awesome webapp to track our assets. In this tutorial we will build an Asset Tracker using an ESP32 microcontroller running MongooseOS, that sends data securely via Cloud IoT Core using MQTT protocol over mobile network, the data is processed in an event-based way using Firebase Cloud Function, saves the data and current device state in Firestore. 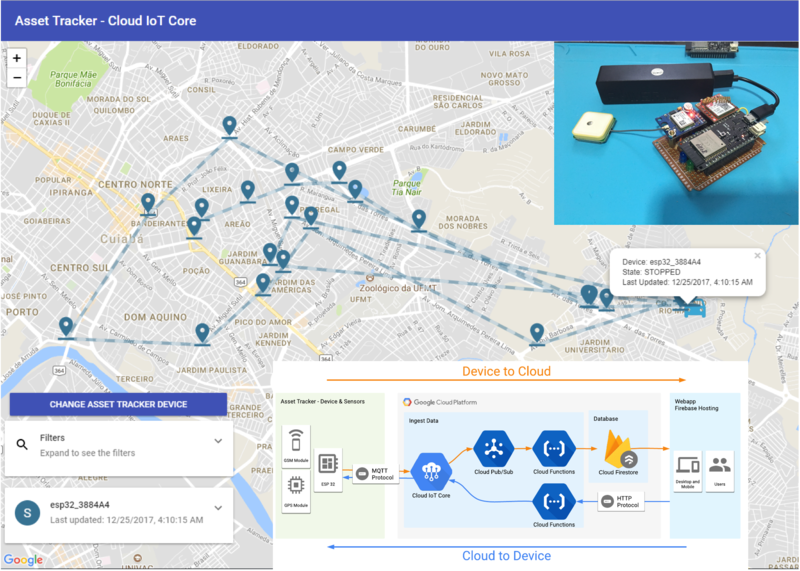 The data then can be accessed through a Progressive Web App hosted on Firebase Hosting, with the possibility to even configure the device remotely, showcasing Cloud IoT Core bi-directional communication. 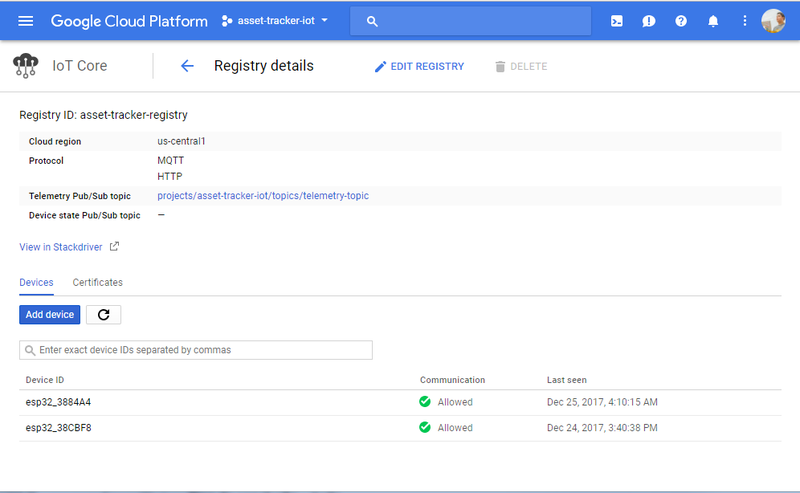 If you are confused by the many terms, I recommend you to read another post that I made about using Google Cloud for an IoT project. In this post, I explain in more details most of these products. Here I’ll be more succinct in the configuration of the project on Google. Making a project that relies on mobile network and with security in mind is not trivial. I’ll show how easy is to do this using MongooseOS and their awesome PPPoS library, that abstracts the network over GPRS/Cellular serial modules, making easier for us to build our products that depend on this kind of communication. 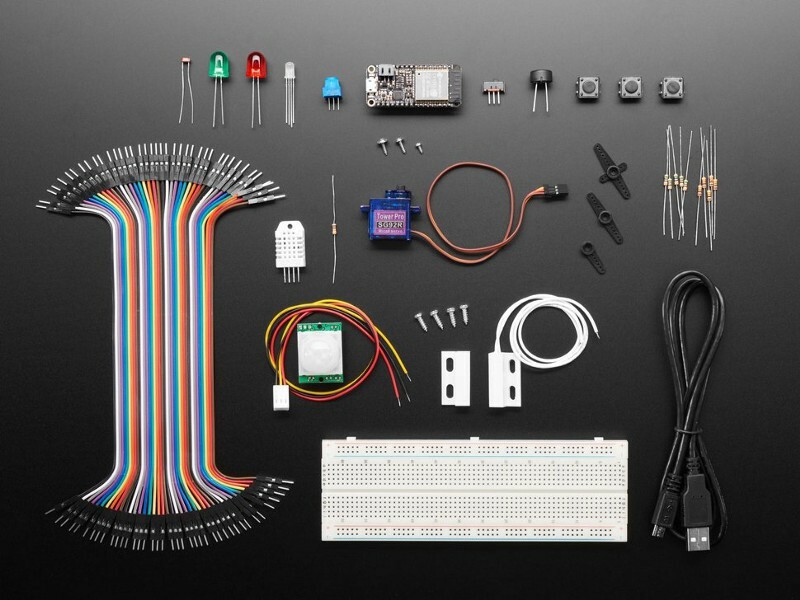 A quick recap of how to create a Google Cloud IoT project. Use MongooseOS with a serial GPRS module. What is Google newest Firestore ? 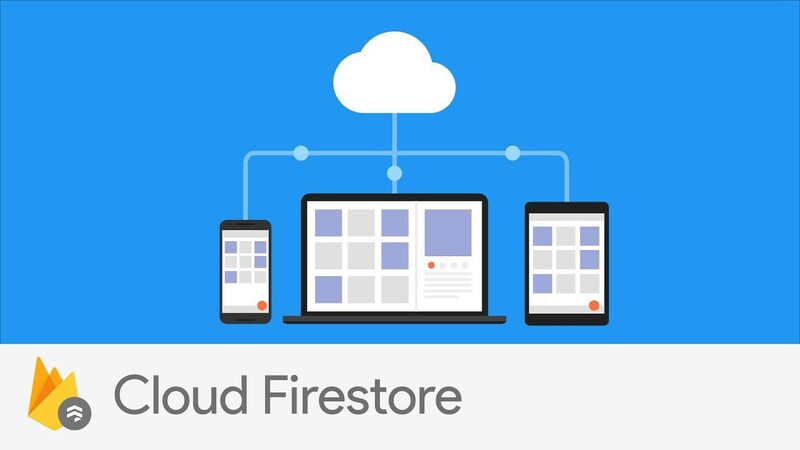 Send data from device to the cloud and store it with Firestore. Send data from cloud to a device using Cloud IoT Core API. To use the gcloud command line tools, follow the instructions here to download and install it. Create a Cloud IoT Registry where the devices will be registered to send data. If you access the Google Cloud Console you can validate that everything is created and configured. In this section, I’ll show how to setup the asset tracker, all modules needed and how to program the board with our code. The heart of our project will be an ESP32 WiFi microcontroller, it has many flavors out there and as far as I known, any model will work. Any ESP32 Board (I used a Lolin32). NEO 6M uBlox GPS module. 220 Ohm resistors for the LEDs. Blue and Green LED for status of the device. 1k and 10k Ohm resistors for the MOSFET trigger. A 1n4007 drop voltage diode, for powering the GSM module. The schematic, in general, is pretty simple. Maybe the only weird part is the GSM module connections. I put a MOSFET to switch on and off the module because it consumes a lot of energy. Making this I can use less energy and put the device to sleep when I’m not sending data. Another detail is the usage of a diode to drop the voltage to power the GSM module with 4.2v, because powering it with 3.3v or 5v is considered under-voltage and over-voltage respectively by the module. Here is the project assembled on a perfboard. To program the board we will use MongooseOS. It has a tools called mos that make programming, provisioning and configuration really easy on the supported boards. To use it we need to download and install it from the official website. Follow the installation instructions on https://mongoose-os.com/docs/quickstart/setup.html. With the tools installed, download the project code on Github repository linked here, so you can build and deploy it on the device. 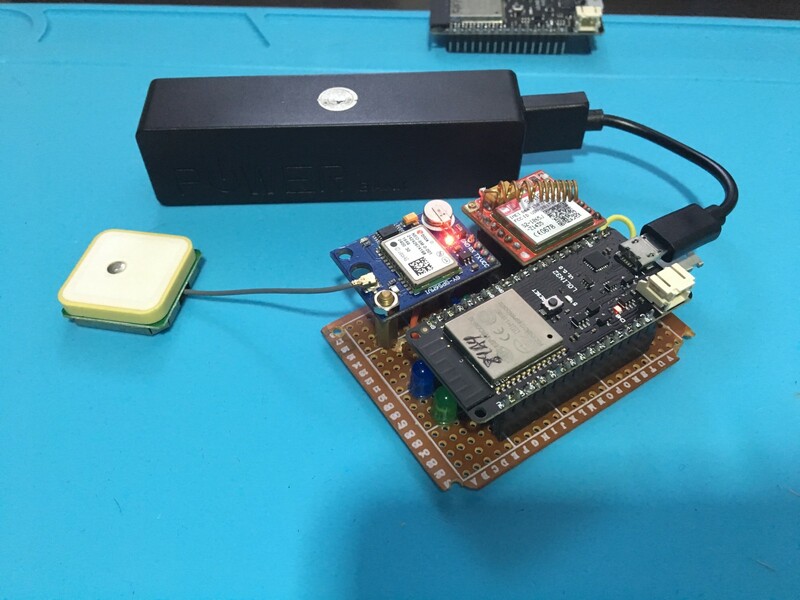 firmware: the MongooseOS project that runs on the microcontroller, that collects location data and sends through Cloud IoT Core using cellular network. functions: the Cloud Functions that will be deployed to on Firebase. Here we have a function that reacts to new data on PubSub and saves it on Firestore. There is another function that it’s basically an HTTP endpoint that is used to send data from cloud to the device and configure the update interval. It will be used by our WebApp so the user can configure the update interval of our device. public: a WebApp built with React that will be deployed on Firebase Hosting and it consults our database to show our devices on a map and interact with them. The project was created using create-react-app. I will detail a little more each project in the next sections. In the mos.yml file we can see the configuration for the PPoS and GPS. You must change it to your SIM Card network APN configuration to make it work. You can also change the UART port being used by the project, depending on your ESP32 model. 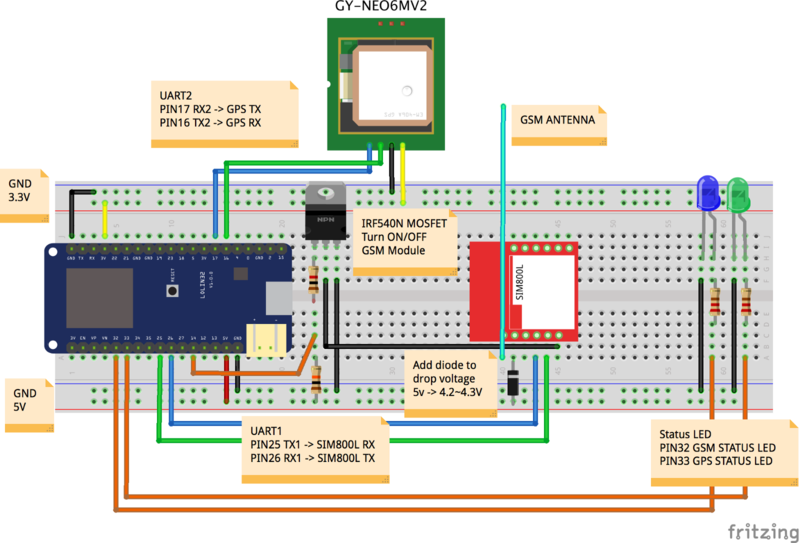 Try to connect to the MQTT server and turn on/off the GSM Led. Try to get some GPS data and then turn on/off the GPS Led. If it’s all working it publishes data through MQTT. After publishing, the device shut down the GSM module after a while (to give time to publish the message) then enter in deep sleep mode. After coming back from deep sleep, the devices reset itself and start all over again. If the devices take too long to publish data, it also enters into deep sleep mode to preserve battery. Run mos build --arch esp32 depending on the hardware selected. This command builds the firmware of our hardware. Run mos flash with the hardware connected through USB to flash the firmware. Run the following command to register this device on Cloud IoT Code. The command generates a public and a private key to be used for the communication, put the private key on the device, send the public key to Cloud IoT core and register the device, getting the deviceId from ESP. Thanks MongooseOS ❤. If you see the data on the console, you can start celebrating, we are on the right path 🎉🏆. 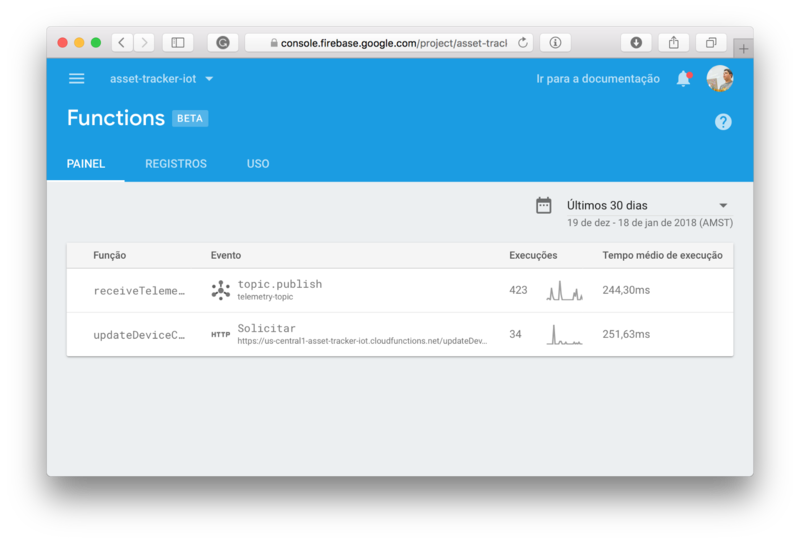 The Cloud Firestore is like a merge of Google Datastore and Firebase Realtime Database, with some features like document and collections definitions, real-time data synchronization, data replication and SDK for many languages. One of the most exciting news to me is that you have the same ease-of-use of all the Firebase products and in comparison with Firebase Database now we have a much better support for advanced queries and data modeling. Maintain devices state in a collection named devices and all of the location data sent by each device in a subcollection named location_logs. Each collection can contain a lot of documents with a flexible schema, this way Firestore enables us to have a better organization of our data and more powerful querying capabilities that scale better. We can have realtime updates on our clients, so we can see the most current data in the moment that it arrives. We don’t need to maintain or scale our database: Cloud Firestore scales with your data and have all the SDKs needed to start making our applications. Awesome serverless development. REGION and REGISTRY: You need to change to your project region and the name of your Cloud IoT core registry using those variables. DISTANCE_THRESHOLD: Control whether we consider the new location data to be a considerable movement of the device ou if I will consider as my device is in the same place. My default setting is to consider 50 meters. exports.updateDeviceConfig: HTTP endpoint that our webapp uses to change the device configuration. The function receives a deviceId and a updateInterval, then call the method modifyCloudToDeviceConfig method of Cloud IoT Core to update the device configuration. We used Google APIs directly, until today we don’t have an official library for Cloud IoT Core (see getCloudIoTClient function). Also when sending a new updated config to the device, the data must be in a Base64 format, but the device receives it already parsed in JSON format. exports.receiveTelemetry: This function that reacts to every data that arrives on Cloud IoT Core configured PubSub topic. This function does most of the hard work, it maintains the device last data on Firestore and also sees if there is a significant movement to insert the new data on the location_logs subcollection. updateDeviceDateIndex: This function is an especial one, here I maintain an index of how many location points is stored for each day for each device, this way we can know what dates to show on the UI without having to do a heavy query on the location logs. When we are working with NoSQL Databases, sometimes we have those trade-offs to achieve better performance. To deploy our functions we need the Firebase Command Line Tools, it requires Node.JS and npm, which you can install by following the instructions on https://nodejs.org/. Installing Node.js also installs npm. Once Node and NPM is installed, run the following command to install Firebase CLI. Run firebase init to associate the local project with your Firebase Project. 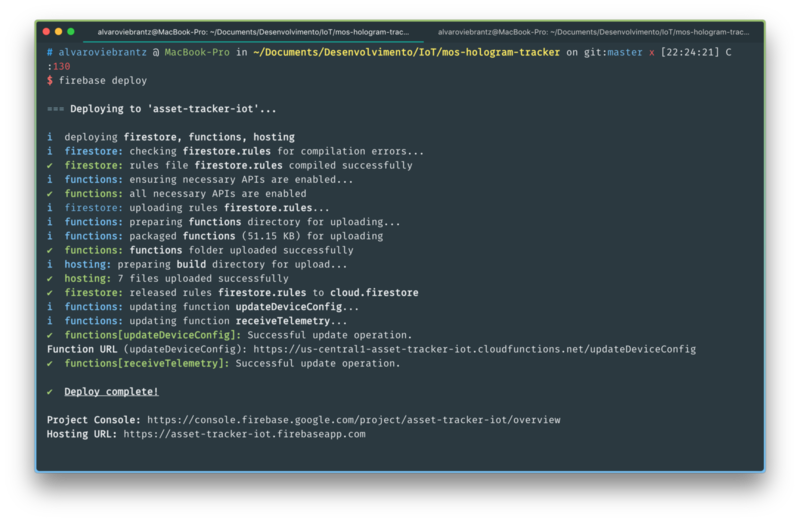 Install cloud functions dependencies with the command cd function && npm install. And finally run firebase deploy --only functions to deploy only our functions, as our webapp first need to be build before it can be deployed. With the deployed functions you have all setup to store our received location data sent by the device and execute our custom rules on how to store it. You can see and monitor all deployed resource on the Firebase Console. You can see executions and the logs of our functions running on Firebase. Now it’s time to deploy our WebApp. For this part of the project, I’ll not enter into too many details because it’s not the main subject for this post, but I’ll highlight some methods that make access to Cloud Firestore. Running npm install on the project main folder that all the dependencies will be installed. To run the local server you can run the npm start command. This will start a live reload server and will also show some lint errors in our code. Really awesome. To build our project you can run the npm run build command. This will prepare our code and assets for production and put all of it in the build folder. After building our project we can now run firebase deploy and have all of our project deployed on Firebase infrastructure. If all it’s correctly setup, then we have another end to end solution created using many awesome tools and better yet: Without touching an advanced and boring server setup. 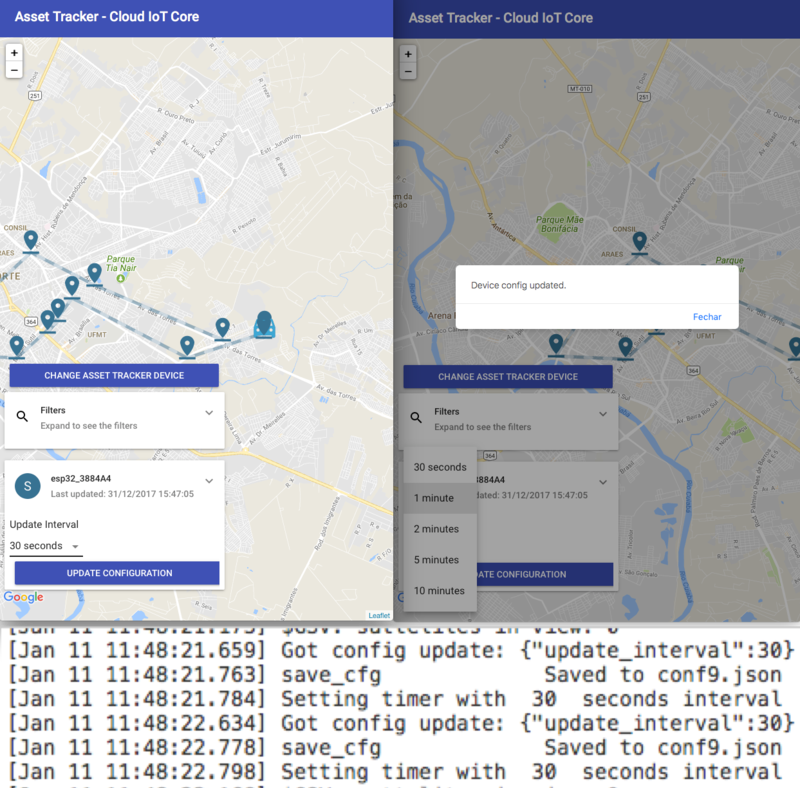 That’s it for this project, we have a really cool asset tracker prototype that uses many new features of Google Cloud and some IoT tools. Hope you guys enjoy this project and I’ll continue to explore more projects using those tools. Do you like this post ? So don’t forget to leave your clap on 👏 below, recommend and share it with your friends. Did you do something nice with this tutorial? Show in the comments section below. If you have any questions, post in the comments that I will try to help you.